This is not the blog post you were looking for if you're looking for the entire story behind what's going on at the Thurston Conservation District. I've been hearing about this on-going train wreck of a story through second-hand accounts and snippets I could find in the official record for months. And there is totally enough here for a real reporter to dig into. And I've been hoping for the adults in the room to take over. But, in the last few weeks, the district dumped a bunch of draft meeting minutes onto their website, giving a more complete picture of the dysfunction over at the TCD. So, I'm going to take a shot at giving you a picture of what's going on. Also, Dani Madrone and I will interview Joel Hansen, an associate (non-voting) board member of TCD, on The Olympia Standard at the end of this week. Lastly, while there is some diagonal overlap between my professional work and this topic, this blog post in no way represents the opinions of anyone I work for. It's all me. Here is the too long, didn't read of the situation: somewhere in the last year, the board of the TCD decided they wanted to change how they funded most of the functions of the district. This is a complicated process in the best of times. But in the meantime, they decided to not re-up the method of funding they did not prefer (as assessment) while they prepared the new method (fees and charges system). Actually, the new system wouldn't even be submitted to Thurston County until May of this year, at best. So, as of January 1, the district lost 40 percent of its funding. Additionally, the dysfunction on the board (which you can read about below) has further slowed the process. Because these obviously aren't the best of times for TCD. Some state-level organizations have taken notice of what is going on. 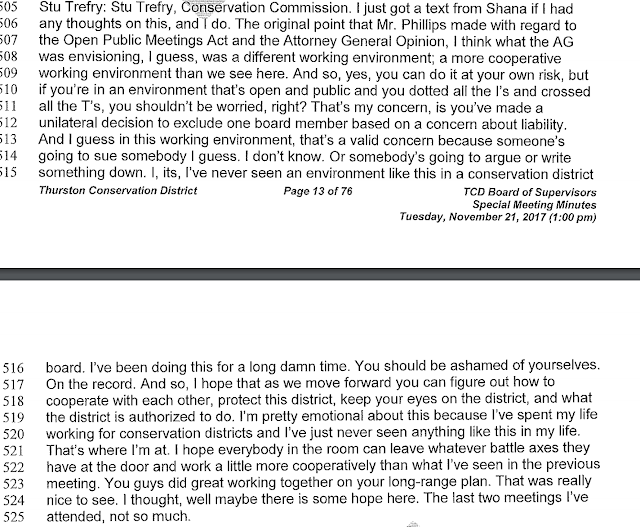 The state Recreation and Conservation Office (which works with TCD on salmon recovery projects) shot off a letter basically telling TCD to stay in their lane. The state Conservation Commission, which oversees all local conservation commissions, began threatening consequences in November if the dysfunction didn't tamp down. The state Conservation Commission has the power to remove board members of local conservation districts and will at least start considering removing board members from TCD soon. 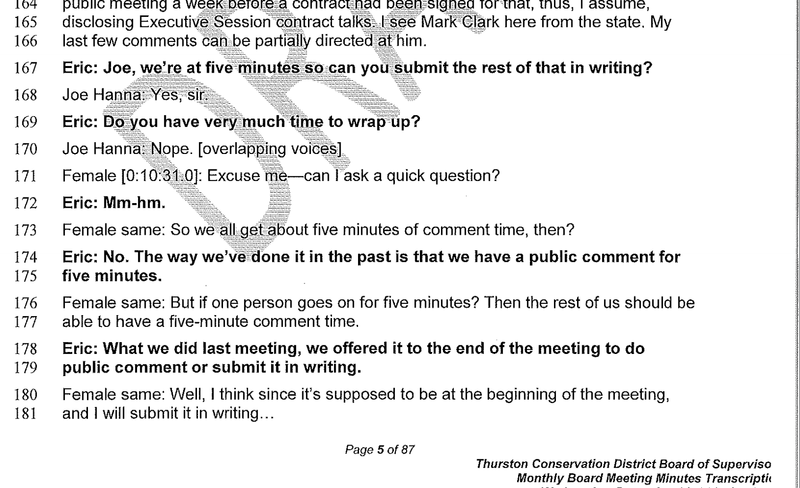 The state commission recently gave their executive director the authority to "issue a notice of a hearing to each supervisor of the Thurston Conservation District regarding removal of supervisors under RCW 89.08.200." Another is a how the board has been limiting public comment, seemingly to people they like. During their December meeting, the board allowed one member of the public to take up all five minutes of public comment. That's all they had allotted, five minutes. And, if one person took it all up, then everyone else would have to give it in writing. Now, it really is up to a board of a commission how they handle public comment. But there's an issue of fairness here. If you only have five minutes, then why let one person take it all? And, if you're going to let one person talk, then why not let other people get up and talk? Most local boards I've either served on or witnesses allow anyone to come and speak, but they've put a limit on the individual speakers' time. Anyway, as you can see from below, this didn't go over well. 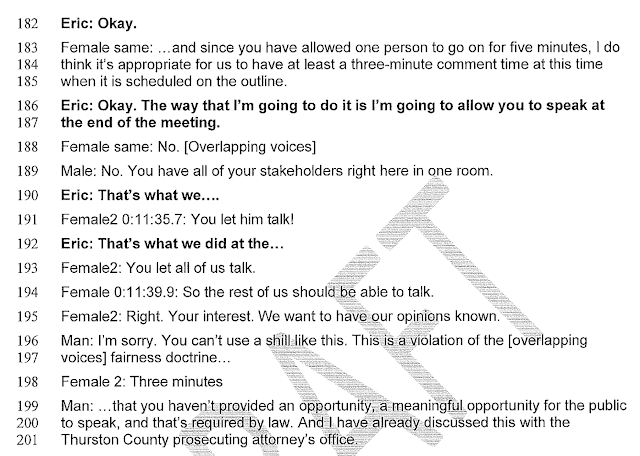 In this particular meeting, the board ended up relenting, but it still looks pretty bad that people from the audience had to essentially shame them into letting everyone talk. It is worth pointing out that the one person they did allow to step up and speak (Joe Hanna) has had at different times interjected into board discussions during the meeting. Also in my experience, this isn't a normal practice either. So what you can do right now to voice your desire for change at the conservation district is vote before March 3. The last day to request an absentee ballot is February 28. There's an open seat on the board which is being filled by probably the weirdest election you'll ever vote in. There's no mail-in ballot, you have to work directly with the conservation district to vote. It used to be that you had to go to the district office, but now you can go online and directly request an absentee ballot. The League of Women Voters are also holding a forum tonight on Tuesday, February 13 for several of the candidates. Voters new to all things TCD must now choose between the three candidates vying for the one empty seat. Official statements from the candidates are at https://www.thurstoncd.com/about-us/board-member-elections/2018-candidate-statements/ but there is (so far as I have found) woefully little online information, comparing or endorsing any of these candidates. I'd certainly be interested in reading comments regarding a specific candidate. If you care about environmental issues, vote for Paul Pickett. 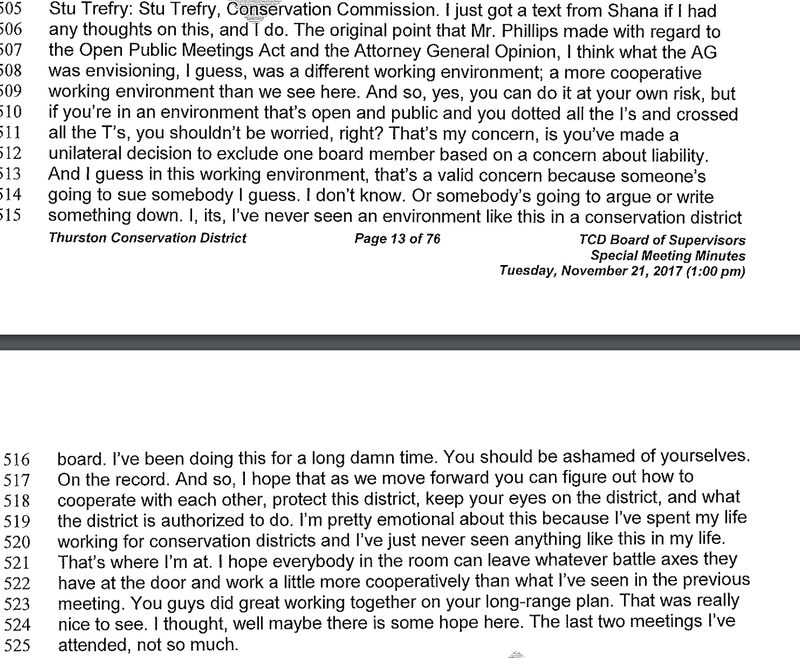 Truly astonished at how corrupt the so-called leaders of the Thurston conservation district appear to be... What's really going on here? What's their agenda? Why won't anyone state their agenda in clear terms? 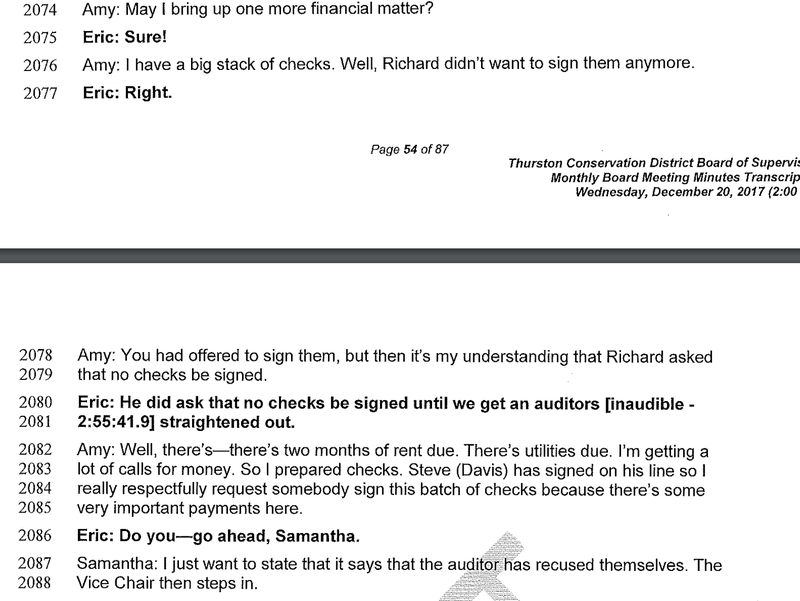 Is the person who is suppose to sign checks for the district refusing to do so because that person is part of the new right-wing takeover of county leadership? Or is there more to it than that? Also, is this election method even legal? I followed all the instructions, voted for Paul Picket and printed up my ballot at FedEx store for $.050 and now the instructions say to spend another $0.50 on this supposed free and fair election? Does anyone know what is really going on here? Seems I need to file a complaint with state elections commission? Has anyone looked into that yet? Who can we complain to and how to best do that? As in how and who do we complain to at all state levels to ensure the overseer of conversation districts in the state experiences overwhelming and unprecedented public pressure to roll heads in Thurston Conservation district? I don't even know where to begin? The level of corruption/stupidity in everything this link offered is so confusing... Who's working on this? How can we help organize and inform a massive public backlash of these fake leaders/destroyers who seem to want to run the conservation district into the ground and destroy it? Is that really their objective? Election process is actually in state law, the arcane process is not the Conservation District's fault. It's worth noting that the person who took up all the public comment time is Joe Hanna, one of the board candidates. He's an associate of the two recalcitrant board members and is the candidate of choice for the anti-government anti-gopher property rights libertarian crowd, essentially the rot at the core of the district board at this time. I strongly urge folks to vote for Paul Pickett who brings 12 years of experience serving on the Public Utility District board and has lots of experience dealing with contentious matters respectfully and calmly. This is a very important election, I urge everyone to vote. I think it is quite interesting that people have failed to take the time to really look at the issues they endorse and support by their statements. I also find it interesting that people will make slanderous/libelous statements and wont sign their names to their statements. I would be happy to discuss any of these matters with anyone. I have attended more meetings than any of the current board members in the last 4 years and was at the "hearing" that didn't occur because there where NO board members present. Two members called in, which their policy does not allow for and subsequently the lawyer that has represented the District for years told them they can NOT do, unless they change their policy. I would be happy to tell the truth about anything you ask me, even if makes me look bad. That is just who I am. 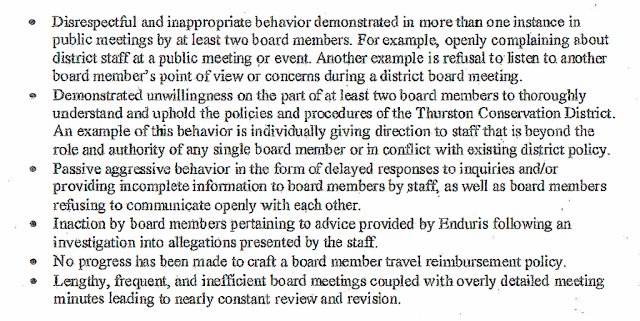 It is unfortunate that the District is in the position they are in, but it is NOT due to what an associate board member, that has had to be reminded his attendance is occasionally required to maintain his position, has stated. I will ask one simple question (one of many possible) of the tax payers of the District; Is it ok with you that a District that is staffed by 10-12 depending on when you look, that has 6 vehicles in the parking lot regularly charges the District for mileage on their personal vehicles instead of using a District vehicle, to the tune of thousands of dollars a year. I am all for spending the tax payer money on projects that we the tax payers can go out and see a tangible benefit. The South Sound Green program at the District is one such project that educates our children and is providing a great educational benefit to our future generations. Another project I have supported and pushed for and the Board has identified as a priority for long before most of the current board members assumed their position is a "home/demonstration farm". I have identified a local city park, that currently is posted with no trespassing signs as a potential site. The property was purchased with Conservation and Recreation funds and the staff at the District have the expertise in obtaining funding through grants to make this happen. It would align with the current park boards thoughts of senior/youth garden plots, conservation demonstrations for the public to learn and enjoy, make a currently unused city park into a resource and showcase for our community. Now that we know the very dramatic and sweeping election results (Paul Picket wins by 87.8% of the votes) I've come back to re-read Joe Hanna's comment and reflect on what he means when he says: "...people have failed to take the time to really look at the issues they endorse and support by their statements." Not just "people" but Joe Hanna himself failed to state, or even point us towards his candidate statement, let alone issues that he stands for. In the statement above their is innuendo of employee waste and how Joe Hanna identified a local city park for a demonstration farm." Meanwhile he portrays himself as more experienced than district board itself and fails to address not just why he occupied all the public comment minutes to prevent the public from commenting, but why he's been reported as meeting with board members for dinner before each meeting. 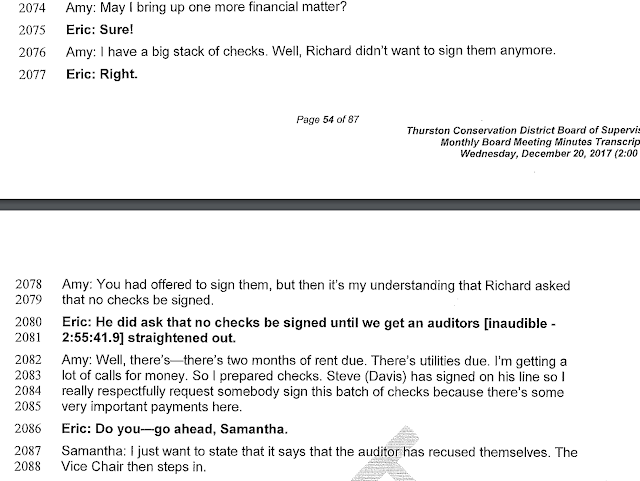 Does Hanna even realize how bad his mostly unstated position looks in light of a board member's refusal to sign checks to pay rent and bills, as well as a collective effort of most boards members to ensure basic funding procedures are scuttled so conservation district employees are out of a job? Clearly Hanna and his ilk don't understand, but thank goodness Thurston county voters understand and he lost completely and entirely in the ballot counting. Next step is all the board members in collusion with Hanna and everything still wrong with district leadership need to be removed by the state overseer of conservation districts.